Lightweight reflex sight combines lightning-fast target acquisition with military-grade durability specifications that meet or exceed those used by special operations personnel working in extreme combat conditions. The non-magnifying lens is crafted from lightweight, impact resistant polymer with an anti-reflective coating for a clear, crisp field of view. Sealed pushbutton conveniently located on the rear of the housing lets you choose between four pre-set intensity levels for the 3.5 MOA dot, or the default Auto mode that automatically adjusts to ambient light conditions. 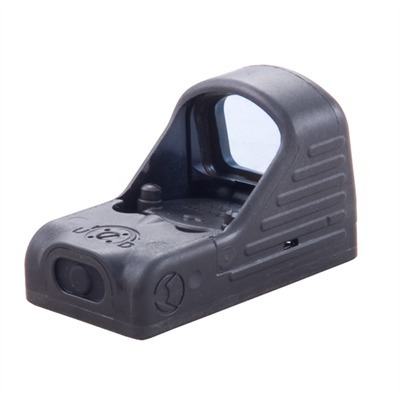 The MRDS fits any mount designed for Docter® red dot sights. The sealed housing is molded from advanced polymers to reduce weight without sacrificing strength, and is waterproof down to 66 feet for up to 2 hours. Extensive salt, fog, drop, vibration, and shock testing ensures this sight meets MIL-STD 810G standards, and will operate at temperatures ranging from -104° F to 120° F. Adjustable for windage and elevation in 1 MOA clicks. Powered by one 3-volt CR-1632 lithium battery, included; depending on output setting, continuous run time on one battery is up to one year. Top-loading battery compartment eliminates loss of zero by allowing battery change without removing sight from mount. Comes with a slip-on protective rubber cover and Insight MiniPro II compact cleaning system for lens maintenance. SPECS: Optic-grade polymer lens and molded polymer housing. 1.9" (4.8cm) long, 1.1" (2.9cm) wide, 1.5" (3.8cm) high. Weight .85 oz. Includes rubber cover, CR-1632 lithium battery, windage/elevation adjustment tool, mounting screws, lens cleaning pen, and instructions. Fits mounts that accept Docter red dot sights (not included).